Mira is a certified Zumba instructor and loves to share her knowledge and passion for fitness with anyone that walks into her classes. She discovered the world of group fitness while attending the University of Maryland where she was the first Zumba instructor on campus in 2008. Four years later the Zumba program has become very popular, and Mira is happy to be part of the Zumba craze! In 2011, Mira was part of Operation 1856: The largest Zumba class to ever take place at the University of Maryland; She had the exhilarating experience of teaching Zumba to 900 people! Mira is certified in the following: Aqua Zumba (that's right- Zumba in the pool! ), ACE Group Fitness, and is a National Council on Strength & Fitness Personal Trainer. Mira has a background in dance and performing which makes her classes fun and full of energy. 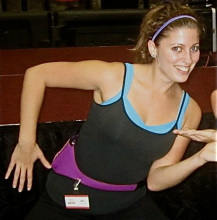 She focuses on the Zumba philosophy, while incorporating a mix of simple dance moves and high intensity cardio.